Please fill in your current password, followed by your preferred new one then confirm and save. 2. I forgot my password, how do i acquire a new one? Please go to your login page, fill in your email address attached to your account and submit. 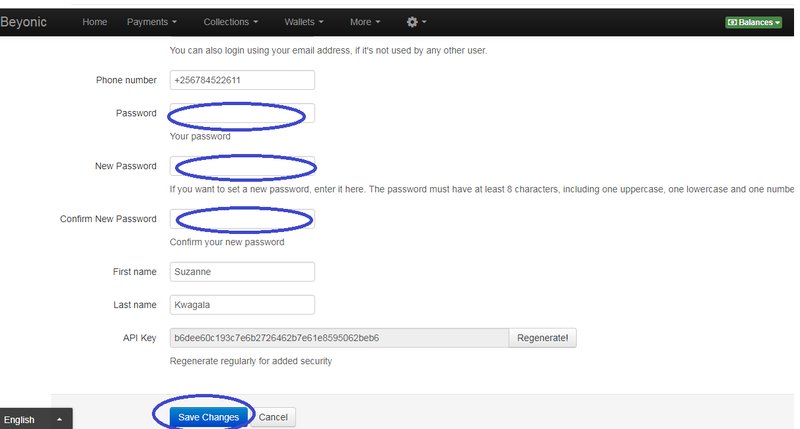 A link will be sent to via email, please click on it to have your password reset. 3. Am not getting a token to login. We have 2 service providers for tokens to ensure there is effective back up when one is down. If the first option of SMS is taking longer than normal please use the second option of "SMS and Phone call" and you will be able to get your token instantly. 4. How do i transfer money from one of my accounts to another on the system? For this kindly reach out to us on [email protected] for assistance. In future we shall make it possible for you to do this from your account. 5. Why can't we pay this contact? In order for a contact to be ready for payment it has to have passed all checks a). it has to be on the network b). it has to be registered on mobile money c). the name in the system has to match with the name used at the point of registration. If contact has any on the checks failed as shown below it means you will not be able to pay it until you either edit the it or do an override. Please do not be quick to override until you are sure the relation between the difference in the information. 6. We have paid the wrong person, how can Beyonic help recover the funds? Kindly note that funds recovery is only possible if the wrong recipient hasn't withdrawn the funds. When you notice you have paid the wrong person please write to us on [email protected] and a reversal request will be lodged with the network as a process to recover the funds. If the network finds the funds still on the account, they will have the account locked until a reversal is finalized and if they find it withdrawn they will immediately let us know so we can get back to you. 7. My payments are "paused for admin action" but am not sure why and what that means. Duplicate payments - We have made it in such away that you can complete these yourself. All you have to do is click on the payment ID, you will a "Retry duplicates" option, click on it to have them completed if you wish them to be completed. Timed out payments - These can only be completed from our end so please send them to [email protected] for assistance. Parked payments - These are stuck because your account has insufficient balance at the moment. They are always completed when your account balance is updated. 8. This user left the organisation, how do we remove their access to our account. This user account can be deactivated by your organisation account administrator. Administrator please go to users, click on the name of the user you wish to deactivate and untick the "Active" button. 9. Our customer made a collection but we cant see it on our account. 10. How do we add new users to our account? This role can also be done by the account administrator. Please go to the "manage users" option, on your right you will the + sign, click on it to add user. Please set for them a special username and password. You will also be able to give them the different right to the system as shown in the screenshot below. Please ensure you do not give them the rights highlighted. 11. How do i extract my monthly statements. Please click on wallets, you will notice that each account has an ID (if you have sub accounts). Please click on the account ID. Ensure the "show fees" box is ticked so that the system fees can also be included on your statement. On your right, you will see a calendar icon, please choose for period of interest by choosing the start and ending date. At the extreme right you will the download option, please click there to choose your format and export as desired.